SOPAC and technical partners coordinated assistance to help four Pacific Island Countries make recent maritime sovereignty history. In April 2010, representatives from the governments of Papua New Guinea, Federated States of Micronesia, Solomon Islands and the Kingdom of Tonga made successful presentations to the United Nations for their respective extended seabed areas. These submissions are made pursuant to the 1982 United Nations Convention on Law of the Sea. Two presentations were made in New York; the first was a joint presentation by the governments of Papua New Guinea, Federated States of Micronesia and the Solomon Islands for the joint Art 76 submission on the Ontong Java plateau. The second was a presentation by The Kingdom of Tonga for the south eastern area of the Kermadec Ridge. The area claimed in the joint submission is for over 600,000 sq km of shared pacific seabed. The area claimed is larger than the combined land mass of the three pacific islands countries involved. It is also significant that for the first time, three Pacific Small Island Developing States have successfully worked together to conclude a joint MOU and submission to the United Nations. 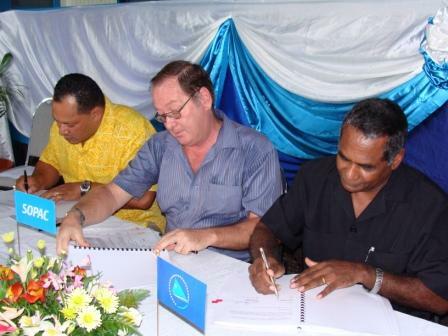 30 March 2010: Dr Jimmie Rodgers, Director-General of SPC, Mr David Sheppard, Director of SPREP and Dr Russell Howorth, Director, Pacific Islands Applied Geoscience Commission (SOPAC),will at the SOPAC Secretariat at 3 pm on Wednesday, 31st March 2010 sign three Letters of Agreement which together comprise full implementation of substantive elements of the Regional Institutional Framework (RIF) Reform agreed to by Pacific Island Leaders at recent Forum Meetings (Annex D of the 2009 Cairns Forum Communiqué refers). The European Union and ACP Secretariat concluded a Contribution Agreement with SOPAC in May 2009 which will facilitate the mobilisation of funding and technical support under the ACP/EU Natural Disaster Facility of the 9th European Development Fund. SOPAC and the UNISDR Secretariat launch the biennial progress review of the Pacific Disaster Risk Reduction and Disaster Management Framework for Action 2005 – 2015 as well as the Hyogo Framework for Action 2005 – 2015. 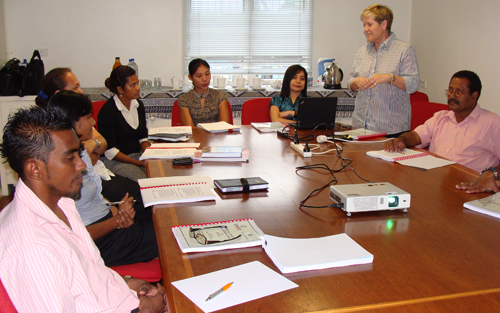 A workshop to launch the mid term reviews of the Pacific Disaster Risk Reduction and Disaster Management Framework for Action 2005 – 2015 (Regional Framework) as well as the Hyogo Framework for Action 2005 – 2015 (HFA) was conducted at the Tanoa Plaza in Suva on Tuesday 13th April 2010. Suva, Monday 22 March, 2010: Today the world focuses its attention on water, the natural resource most vital to life. World Water Day, established by the United Nations General Assembly in 1993, is used as an opportunity to highlight critical water issues facing the planet. This year’s theme, “Clean Water for a Healthy World”, aims to raise global awareness on the importance of water quality for human health and the environment. The impacts of recent natural disasters on water quality, outbreaks of typhoid in Fiji and Samoa, and a cholera epidemic in Papua New Guinea show that access to clean, safe water continues to be a major issue in the Pacific. Your Excellency Ambassador Chin, Commissioner Western Joeli Cawaki, Distinguished Guests and School Children, Good Morning. I would like to welcome you all to the celebration of this year’s World Water Day, which has the theme: Clean Water for a Healthy World. You may be aware that World Water Day has been celebrated annually since 1992 as an outcome of the World Summit on Environment and Development held in Rio, Brazil. Forum brings together managers and policymakers from ICT and disaster risk reduction sectors to address challenges in making communities safer in the Pacific Islands. Representatives of 12 Pacfic Island Countries attended the Forum which was from 7-9 July 2009 in Apia, Samoa. The Forum was followed by a joint SOPAC/APCICT Academy workshop on the 10th July covering linkages between ICT and MDGs, ICT for Development Policy, process and governance. Majuro, June 27, 2012: An expert from Tuvalu is leading the construction of composting toilets in Majuro, the Republic of the Marshall Islands (RMI), to trial how effective they are at reducing septic pollution of Majuro’s main groundwater resource, the Laura water lens. The dry eco-san composting toilets use very little water and have the twin benefits of both conserving water and preventing sewage from leaching out of septic systems and into the surrounding environment. The toilets have already been successfully trialled on Tuvalu’s main atoll of Funafuti, where 40 toilets have been constructed. Tuvalu’s experience with these toilets has also generated interest in other Pacific island countries. Tonga has constructed two demonstration toilets in households on the island of Vava’u, while Nauru has installed them in several primary schools.The initiative is part of a regional Global Environment Facility (GEF) funded Integrated Water Resources Management (IWRM) demonstration project to build the capacity of Pacific Island countries to manage water resources. Pisi Seleganiu, Project Manager of Tuvalu’s GEF IWRM project currently in Majuro, believes composting toilets are the most appropriate sanitation technology for atoll countries which have scarce water resources and porous soils.